Bobby Smith (pictured), co-founder and, for the most part, the lead singer of the iconic R&B group, The Spinners, has passed away at age 76, reports Soul Tracks. Smith passed away from complications of influenza and pneumonia; it was also reported that he had been suffering from lung cancer. The five member group, which consisted of Henry Fambrough, Billy Henderson, Smith, Pervis Jackson and G.C. Cameron, had a strong following in the sixties. But their careers really took off in the 70′s, when they began collaborating with famed record producer/writer Thom Bell who helped to orchestrate the Philly sound. The group went on to release consecutive hits. Smith’s melodic voice could always be singled out on such 70s hits as “I’ll Be Around,” “Could It Be I’m Falling In Love” and “They Just Can’t Stop The (Games People Play).” Even though Smith took the vocal helm, singing lead on most of the group’s chart-busting hits, another member who joined later down the line, Philippé Wynne, is oftentimes incorrectly credited as the main vocalist. Wynne, who replaced G.C. Cameron in the mid-seventies, did sing on a few of the group’s hits such as “Rubberband Man,” “One of A Kind (love Affair)” and “How Can I Let You Get Away” but left in 1977 to pursue his own solo career. Wynne had a heart attack while performing at a Vegas nightclub and died a few hours later at age 44. Throughout the years, as lead vocalists came and went, Smith’s vocals were the quintet’s mainstay. The Spinners tried to keep their momentum going all the way through to the 90s but soon were bumped off the charts and relegated to performing in oldies circuits. The new millennium brought illness and death to several of the group members. John Edwards (Wynne’s 1977 replacement) suffered a debilitating stroke in 2002. Henderson died in 2007 followed by Jackson in 2008. 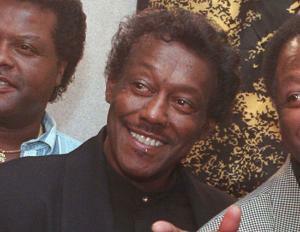 The only two members left of the original group are Smith and Fambrough.